Can be used by people with sensitive skin! 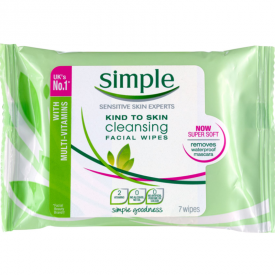 These face wipes are nice and easy to use. Just whip one out the packet and you have a face wipe, body wipe or even hand wipe. Each wipe is a decent size. The thickness is good too. There isn't a strong smell to them which is good with regards to using on your face daily. They packet isn't huge and it's fits into your handbag easily which makes these a nice and convenient buy. Good for sensitive skin with multi uses. Not heavily fragranced and great if you need to freshen up on the go.